The US, UK and France have attacked Syria's chemical weapon sites to teach the country a lesson and also to demonstrate to the rest of the world that use of chemical weapons in any conflict is unacceptable. Just a few weeks back, the UK had engaged Russia in a diplomatic offensive owing to the suspicion that they had poisoned Sergei Skripal, a spy (of Russian origin) and his daughter, Yulia, by using chemical weapons. The United States and its allies have attacked three facilities associated with Syria's chemical weapons programme. They have targeted: a scientific research centre in the greater Damascus area, a chemical weapons storage facility west of Homs, and a chemical weapons equipment storage facility and command post, also near Homs. Almost a year back, the US alone had attacked a Syrian airfield massively by launching more than 50 Tomahawk cruise missiles as a punishment for using chemical weapons then. In comparison, the present attack was not all that powerful. Naturally, this attack is more symbolic in nature, more to demonstrate to the rest of the world that no chemical nonsense is accepted. This latest salvo in the seven-year war in Syria, an apparent chemical attack in the suburb of Douma, has actually presented a new challenge to the western powers. Just few days back, US President Donald Trump had announced that the US would like to exit from the Syrian theatre but, it appears that now, it would be difficult for them to withdraw at least in near future. In recent times the use of chemical weapons, including sarin, chlorine, mustard gas and poison gas, in Syria could be said to have begun during August 2013. However, major military response took place when on April 2017, a chemical weapons attack killed dozens of people in Khan Shaykhun, in northern Syria. To this attack, Trump had given a military response. But this strike had little practical effect, with Syrians using the airfield again within 24 hours and similarly the latest military response is also not likely to achieve much. The present situation in Syria broadly raises one question and one concern. The question is "why chemical weapons are bad but, conventional weapons are acceptable?" and the concern is: Is the conflict in Syria actually indicating more about the possibility the emergence of New Cold War. 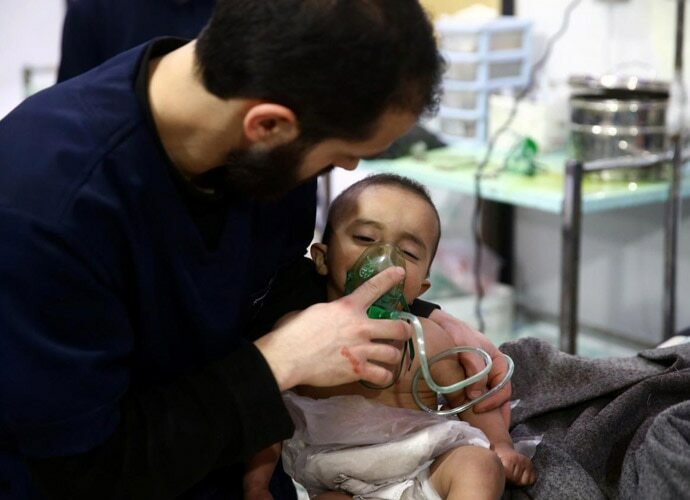 The April 7 attack in the rebel-held town of Douma, east of Damascus, is known to have killed an estimated 40 people including children with lethal chlorine gas. Since, 2013 many more deaths have taken place when chemical weapons were used. The Independent International Commission of Inquiry on the Syrian Arab Republic says it has confirmed at least 34 chemical attacks since 2013, many of which it said used chlorine or sarin, a nerve agent, and were conducted by the Syrian government. 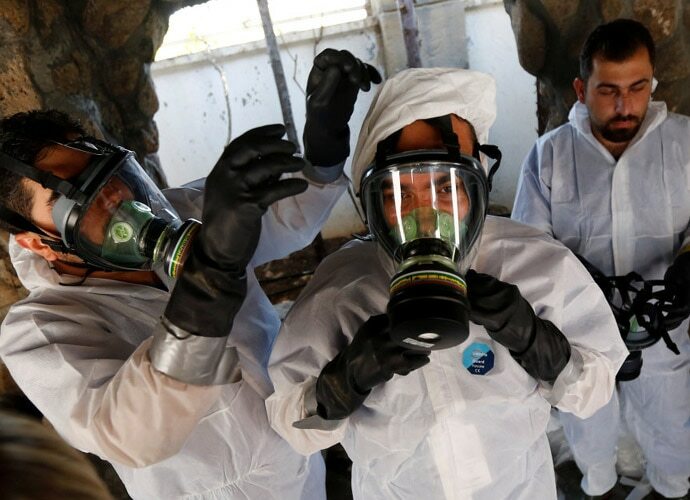 Possibly, more than 2,000 people have died in Syria so far owing to the use of chemical weapons since April 2013. In the entire conflict in the Syrian theatre which began in 2011, as per various estimates, around 300,000 people have died so far. Chemical weapons are far more effective as a tool of terror than as a battlefield weapon. But in Syria, this weapon is found repeatedly getting used. Syrian government has signed the Chemical Weapons Convention (CWC) and should not use these weapons. But, is the Bashar al-Assad government the actual user of these weapons? Is the western intelligence trustworthy? In the last five years, there has been some confusion over whether the Assad regime has used these weapons or the rebel forces have used them. Assad has always denied the use of such weapons. Using chemical weapons amounts to engaging in the most heinous form of warfare and such use should always be contemned. But at the same time the entire debate highlights the hypocrisy of the western powers which are blind to the reality of indiscriminate human killings in the same region and intentionally supporting the rebel forces to bring the Assad regime down by overlooking the number of deaths reported daily. Today, at the international level the battle lines have become very clear with Russia and Iran supporting Assad and western powers and Israel being in the opposition. Technically speaking, all these powers have a common enemy called ISIS but, they do not have any common agenda to finish ISIS. After seven years of war, it is coming clear that no one has any interest in helping the Syrian people anymore. Various powers involved in this conflict are actually interested only in securing their own interests. The recent attacks by the US, UK and France were just meant to give Russia a signal. The limited nature of attack indicates that these powers are not keen on an escalation in conflict. They don't want to have a direct military confrontation with Russia, but keen to keep Russia and Iran under check. Various recent events at the geopolitical level from cyber espionage to the spy incidence in the UK and Syrian issue, clearly indicate the widening gulf between the west and Russia. Is this the beginning of the new Cold War?